Hyperpigmentation on dark (African) skin. My skin is about a medium brown colour (I am African) and I have a lot of dark spots from previous acne breakouts on my face and my back that I am trying to get rid of. I've had a problem with this since I was a kid (I'm 27 years old now); it seems that every tiny thing scars my skin. I am just wondering what would be the fastest way of getting rid of this hyper pigmentation? I'm guessing that derma-rolling works just as effectively on dark skin as it does on lighter skin? I have tried exfoliating (am now using a face lotion with 10 percent AHA). I am afraid to try bleaching creams. Have tried using lemon before but didn't not really work (perhaps I did not use it for long enough). I guess my main questions are, do dark spots on dark skin heal in the same cycle/pattern as those on lighter skin? and If I choose to use derma rolling to reduce the dark spots, what creams or topical agents should I be using in combination with it? I have purchased the vitamin C powder from your site, but not sure if it helps with hyperpigmentation? Do vitamin E and Shea butter really help fade dark spots? And thanks very much Sarah for taking time to read these questions, it is certainly appreciated. I don't think you should fret over usng bleaching cream. I've a feeling you are referring to hydroquinone? Ian et al. did a study on "Safety and efficacy of 4% hydroquinone combined with 10% glycolic acid, antioxidants, and sunscreen in the treatment of melasma" (LINK). I thinkk you should invest in a skin care regimen that includes a combination four different types of active ingredients: an exfoliant, a retinoid, a melanin inhibitor, and sunscreen. I am curious to know what AHA product you are using. What is the brand and name of the product? Also, at 10% concentration, I think you'll only get the faciliation of cell turnover at the very top of the epidermis. Your hyperpigmentation is probably an issue deeper in your skin layers. Plus, if the pH of the acid is too high, it's not doing anything for your skin. Sarah's sell a 0.05% Tretinoin Gel. If you get too much irriation from prescription retinoid, you might want to try OTC vitamin A like Neutrogena Healthy Skin Anti-Wrinkle Cream, Night Formula (normal to dry skin type) OR RoC Multi-Correxion Night Treament (for normal to oily/combination). An affordable and good 2% hydroquinone cream is Ambi Skin Discoloration Fade Cream (normal to dry). A good 2% hydroquinone gel (w/ 2% salicylic acid at pH of 3) is Paula's Choice RESIST Remarkable Skin Lightening Gel with 2% BHA (for normal to oily/combo). Civant is a company that has a hydroquinone-free alternative. The product focuses on plant extracts and vitamin B3 and C.
An affordable and broad spectrum synthetic sunscreen for dry skin is Coppertone Ultra Guard Sunscreen Lotion SPF 50. For oily skin, you can try Neutrogena Ultra Sheer Daily Sunblock, Liquid SPF 55. For total physical sunscreen blocker, you can try Neutrogena Sensitive Skin Sunblock Lotion SPF 30 with only titanium dioxide as its active. Along with your interval derma rollin, you should be able to speed the skin lightening effect rather quickly! Wow K, you are awesome! Thanks for all the great information. The lotion i use is Neostrata Smoothing Cream (Level 3). I started with their level 1 which I think only has 4 percent AHA in it, then worked my way up to their level 3 cream. I actually thought 10 percent was a lot, but I guess not? I have the AMBI cream but was afraid to use it after I read some horror stories on the internet. Perhaps i will give it a try and see if i have any reactions. So in what order would I use those four products? I suppose the exfoliant first and the sunscreen last (or every day).., and what exactly is the function of retinoids? (Sorry, I am a newbie.) I'lll google it now .. I also had concerns abotu sunscreens and toxicity.. did some reading that suggested they should be used in moderation. What do you think about this? In the past I've used mineral makeup as a natural sunscreen in place of a lotion with spf in it. I suppose the toxicity leve depends on the lotion? Usually, hyperpigmentation is a result of locally uneven/excessive melanin production. Melanin is the pigment that determines the color of our skin. When our skin is exposed to the sun, the skin produces more melanin as a natural protection – melanin absorbs UV. On sun exposure, the pigmentation might re-appear or get worse. Uneven/excessive melanin production can also be the result of skin trauma - burns, acne, cuts, bug bites etc. Melanin is produced by cells called melanocytes. Dark skinned individuals do not have more melanocytes than lighter skinned persons but their melanocytes are just more active. A dark complexion is more prone to hyperpigmentaion = localized areas with excessive melanin deposits. You have to concentrate on products that reduce melanin production. Make a homemade vit. C serum according to our dermarolling guidelines and apply it to your skin every second day. Vit. C is a mild tyrosinase inhibitor. Tyrosinase is the enzyme that converts tyrosine to melanin, making vit. C therefore a mild skin lightener. It is also an anti-inflammatory, which should help with the residual inflammation from acne. You can try this: thoroughly clean a lemon skin. Using a fork, make the skin leak its juice and apply it on your hyperpigmentations. Cover it with plastic foil. Follow this procedure twice a week. If it irritates the skin, stop using it. Lemon juice also contains tyrosinase inhibitors. Hydroquinone is a strong tyrosinase inhibitor. It is safe for dark skin individuals in concentration not exceeding 2%. Do not use Tri-Luma (it contains hydroquinone) but it also contains a steroid. Steroids inhibit collagen synthesis and act as anti-inflammatory. TriLuma is intended for Melasma where inflammation is involved and it is useful in this case, but applying steroids on your skin without a good reason (you do not have Melasma) is a very bad idea. Retinoids such as A-Ret even out melanin distribution in the skin. Lactic acid or Arbutin are lowering melanin production as well. I am not aware of Shea butter having an effect on melanogenesis but it is a good moisturizer and it soothes the skin. 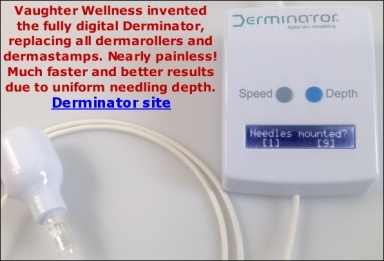 A 0.5 mm dermaroller is very good for pigmentation because "ordinary" hyperpigmentation s usually not so deep. Rolling speeds up the skin's turnover and thus help diminishing pigmentation. You should roll two or three times a week with 0.5 mm and protect your skin from the sun as much as you can. Under no circumstance should you go outside in the sun immediately after rolling. Roll before going to bed and apply a high factor sunscreen in the morning. We have customers who improved their hyperpigmentation even with a 0.2 mm roller. This took about 6 months. Also, when you use a sunscreen (I hope you do), use one that has only physical blockers and no chemical blockers. Cyn;977 wrote: Wow K, you are awesome! Thanks for all the great information. Base on what you have provided in this thread, I am going to take a guess on your skin type using Dr. Leslie Bauman Skin Type Solution terminiology. I believe you OSP(W or T); that is, your skin type is Oily, Sensitive, Pigmented, and the only think I am not sure is whether your skin is wrinkle or tight. I highly encourge you to take the free questionaire (and be honest about it) to find out your complete and accurate skin type --> LINK. You must register before you can begin with the quiz. You should join the forum there if you want some skin care regimen solutions! Well, if my guess is correct about you being oily. I highly suggest you reconsider buying cream-base products. These types of products tends to heavy and thick that include emollients and waxes and film-forming agents that can be detrimental for acne-prone skin. You should incorporate a skin care regimen that is tailor for your skin type! Use a water-soluble cleanser the rest of your leave-on products should have at light lotion or gel or liquid consistency because they absorb into your skin a lot quickier and there is minimal risk of clogging your pores and causes acne havoc. If you have dry areas, then use a fragrance-free light lotion and apply over those areas. Body lotion works. In addition to your daily 10% AHA product, your hyperpigmentation will be benefited further with a series of superficial or lunchtime chemical peels! I am think 30-50% glycolic or 50-70% lactic. I am not going to suggest you do that on your own so I suggest you see your licensed esthetician or dermatologist for that procedure! Not only will you get rid of skin discoloration faster, you get smoother skin and less wrinkled. Exfoliation helps the to better penetrate retinoid and hydroquinone. Chemical peels are costy! The order of products may be exfoliant and sunscreen in the morning, retinoid & hydroquinone at night, follow by moisturizer (optional). If you have acne medication apply that in the morning. I am specifically referring to benzoyl peroxide because it does counteract with Tretinoin. If you like to incorporate vitamin C in ascorbic acid form, you should not mix with retinoid. But Vitmain C can be mixed with hydroquinone. Another thing, you say you use mineral make up, I am think you are referring to mineral powder. Correct me if I am wrong. If you are solely dependent on the powder as your sunscreen, I think you need to change that because it does not provide liberal coverage for your skin from the sun, which can very much negate any skin lightening benefits you want to achieve. Why? When you are dusting on your powder, there is no guarantee an even layer of powder still stick onto your skin (which it should to provide protection). Here is an easy to read article on this --> LINK . If you prefer only natural sunscreen active like titanium dioxide or zinc oxide then you should look into Neutrogena and Blue Lizard line of products. Be cautions that their products tend to be thick and for dry skin types; also, for darker complexion more than likely will leave a whitish tinge. OR, you can use makeup with physical active like L'Oreal True Blend or Almay (check their ingredient list). Make up will be better since they are tinted. L'oreal has a better collection of colors. I hope you can find one that fits your skin tone. Also, you can reapply your sun protection with mineral only pressed powder which you can find from Neutrogena. two vidoes you might like to view! You can try this: thoroughly clean a lemon skin. Using a fork, make the skin leak its juice and put it on your hyperpigmentations. Cover it with plastic foil. Follow this procedure twice a week. If it irritates the skin, stop using it. Lemon juice also contains tyrosinase inhibitors. Hydroquinone is a stronger tyrosinase inhibitor. It is safe for dark skin individuals in concentration not exceeding 2%. Lactic acid or Arbutin are lowering melanin as well. A 0.5 mm roller is very good for pigmentation because pigmentation is usually not so deep. Rolling speeds up the skin's turnover and thus help diminishing pigmentation. You should roll two or three times a week with 0.5 mm and protect your skin from the sun as much as you can. Under no circumstance should you go outside in the sun immediately after rolling. Roll before going to bed and apply a high factor sunscreen in the morning. We have customers who improved their hyperpigmentation even with a 0.25 mm roller. This took about 6 months. Thank you so much for this info Sarah (and sorry for my delayed reponse). I already have a 1.5 meter roller, and I understand that its is ok to use it on my face. I'm guessing its not wise to use a 10 percent AHA lotion right after rolling? Or a lotion containing Hydroquinone? I think I will try hydroquinone instead of the lemon, since it is stronger... will see if I have a reaction to it. Ive tried using vitamin e in the past but with little success; I read the study that you posted and it seems to explain why. I'm looking forward to when the vitamin c arrives- excited to try it. kakalakingma;979 wrote: Base on what you have provided in this thread, I am going to take a guess on your skin type using Dr. Leslie Bauman Skin Type Solution terminiology. I believe you OSP(W or T); that is, your skin type is Oily, Sensitive, Pigmented, and the only think I am not sure is whether your skin is wrinkle or tight. I highly encourge you to take the free questionaire (and be honest about it) to find out your complete and accurate skin type --> LINK. You must register before you can begin with the quiz. You should join the forum there if you want some skin care regimen solutions! Thanks again K. Actually my skin is very dry, apart from my t zone, which is oily. So i suppose I have combination skin. Dont really have wrinkles yet... I will take the test that you suggested and see what result I get. I wish I could afford chemical peels right now! Until I can afford them I think I will try the routine you and Sarah have suggested. Youve given me a lot of info to chew on- I'll certainly take a look at all of it! Cyn;987 wrote: Thanks again K. Actually my skin is very dry, apart from my t zone, which is oily. So i suppose I have combination skin. Dont really have wrinkles yet... I will take the test that you suggested and see what result I get. Oh, you have one difficult skin type and I mean that with no offense just because you have to battle with blemishes and very dry skin, that's tough! I wish you the best, Cyn! I think you will benefit from this type of skin care regimen: (1) You should use a gentle cleanser with emollients to cushion your skin while you cleanse without stripping your skin; (2) for your acne/blackhead oily skin issues, you should use a salicylic acid gel or liquid for your entire face or just your oily T-zone; (3) for preventative/corrective treatment, you should invest in a vitamin concentrate or another kind of antioxidant concentrate or retinoid serum; (4) now you can moisturize your dry areas with an emollient lotion or cream at night and a lotion or cream with SPF in the morning. I have a subscription to Beautypedia, a website that reviews skin care products. If you want suggests for affordable products in your regular drugstore brands or high end brands you ask and tell me the brands or whatever, and I will gladly help you with that!